I am a certified birth doula and I completed my training and certification with DONA International, the oldest, largest and most respected doula association in the world. In addition to my doula training and certification, I am a Lamaze Certified Childbirth Educator (LCCE) and a mom of two. While I believe professional training and certification is important, I also believe my personal birth experiences allow me to connect with my clients on a much deeper level. Attending births has allowed me to gain priceless experience with several birthing techniques (including aromatherapy, hydrotherapy, HypnoBirthing etc) in various settings (hospital, birthing center, home). I have worked with clients trying to achieve a natural birth as well as a medicated birth, with first time moms as well as repeat birth clients, with moms carrying one as well as two babies, with midwives as well as obstetricians. I have gained experience with VBAC, gentle cesarean, and healing birthing following a traumatic birth experience. I am available for due dates in June – August 2016. If you don’t see your area listed, please contact me anyway as I may be able to accommodate you. However, I currently do not accept clients residing or giving birth outside of New Jersey. (*) What’s a Visual Birth Plan? As mentioned above, every client will receive a Birth Plan Sample (Word Document) for you to personalize and a custom Visual Birth Plan (PDF). 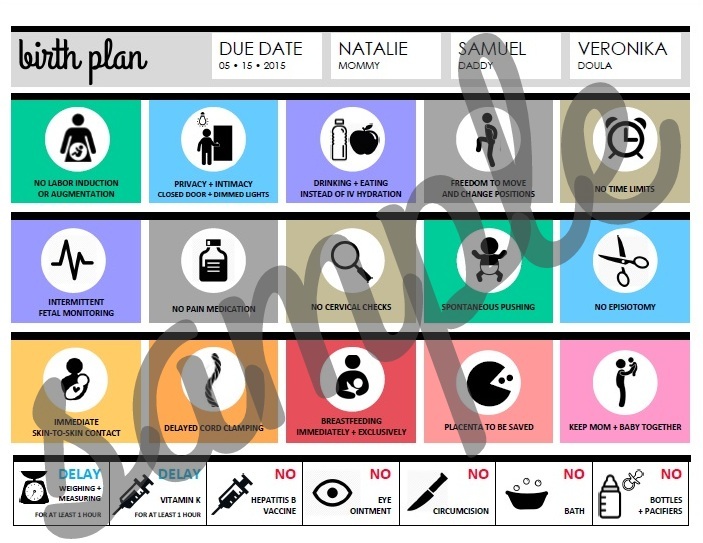 A Visual Birth Plan is a very useful addition to your written birth plan. While I strongly believe it’s a good idea to summarize your labor & birth preferences in writing and go over them with your caregiver, a couple of pages of text may not be very efficient during labor. I find the visual birth plan a lot more effective in the hospital environment as it’s easier and faster to “read” for the busy hospital staff while still getting your point across. For pricing, additional information and to schedule your complimentary in-person meeting, please contact me. A face-to-face meeting is a great opportunity for you to ask any questions you’d like. Here is a great article with question to ask your would-be doula. Women have complex needs during childbirth. In addition to the safety of modern prenatal care and the love and companionship provided by their partners, women need consistent, continuous reassurance, comfort, encouragement and respect. They need individualized care based on their circumstances and preferences. The role of the birth doula encompasses the nonclinical aspects of care during childbirth. Doulas provide assistance in gathering information for women and their partners and continuous and compassionate physical and emotional support during labor and birth. Perhaps the most crucial role of the doula is providing continuous reassurance and comfort for the entire labor. Doulas are well-versed in non-medical skills and do not perform clinical tasks, such as vaginal exams, fetal heart rate or blood pressure monitoring. Doulas do not diagnose medical conditions, offer second opinions or give medical advice. Most importantly, doulas do not make decisions for their clients; they do not project their own values and goals onto the laboring woman. The doula’s goal is to help the woman have a safe and satisfying childbirth as the woman defines it. Of course, the woman’s partner is essential in providing support for the woman. A doula cannot make some of the unique contributions that the partner makes, such as a long-term commitment, intimate knowledge of the woman and love for her and her child. The doula is there in addition to, not instead of, the partner. Ideally, the doula and the partner make the perfect support team for the woman, complementing each other’s strengths. Some men may feel overwhelmed by expectation to be intimately involved as advisers, coaches and decision-makers for women. This turns out to be an unrealistic expectation for most men because they have little prior knowledge of birth or medical procedures and little confidence or desire to ask questions of medical staff. In addition, some men feel helpless and distressed over the women’s pain and are not able to provide the constant reassurance and nurturing that women need. With a doula present, the pressure on the partner is decreased and he or she can participate at his or her own comfort level. Partners often feel relieved when they can rely on a doula for help; they enjoy the experience more. For those partners who want to play an active support role, the doula assists and guides them in effective ways to help their loved ones in labor.